Hello Friends! 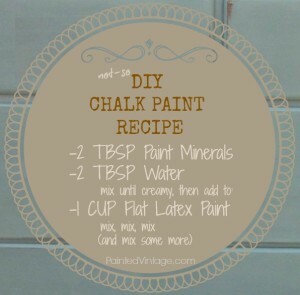 Today, I’d like to share with you a (not so) DIY Chalk Paint Recipe, using a product I have been testing. 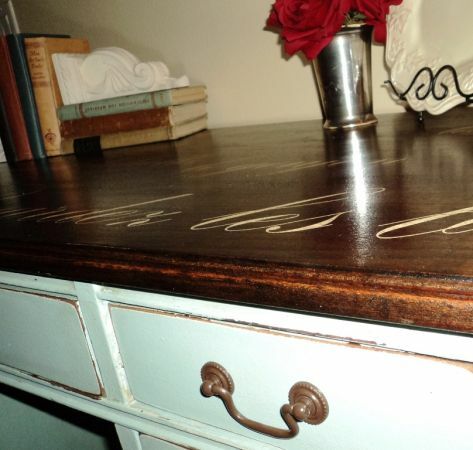 I know you guys have heard all the hype about the miraculous Chalk Paint, and many of you are devoted fans. But for those who haven’t, Chalk Paint is a beautiful velvety, matte finish paint for furniture that requires NO sanding, priming, or any other surface preparation what-so-ever. It distresses beautifully, and can be waxed to a luminous, smooth finish. Why, it practically paints itself on, and for the price, it should! It costs roughly $40 per QUART, plus shipping, because it is available only from exclusive stockists. Oh, and the limited color selections are gorgeous… if you purchase several quarts to mix your own color. Enter the world of DIY Chalk Paint Recipes. 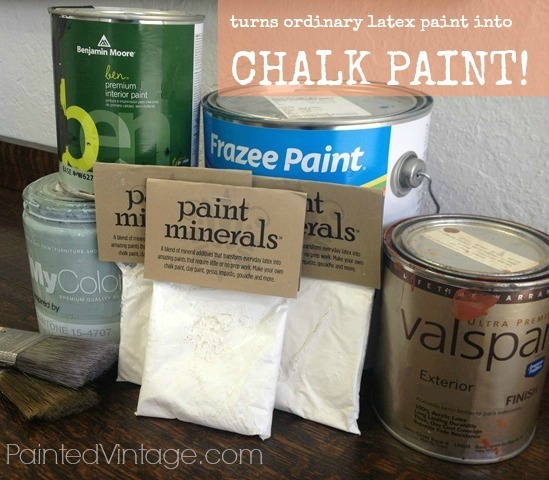 There are several variations to the DIY Chalk Paint Recipe out there! And believe me… I’ve tried them all!! 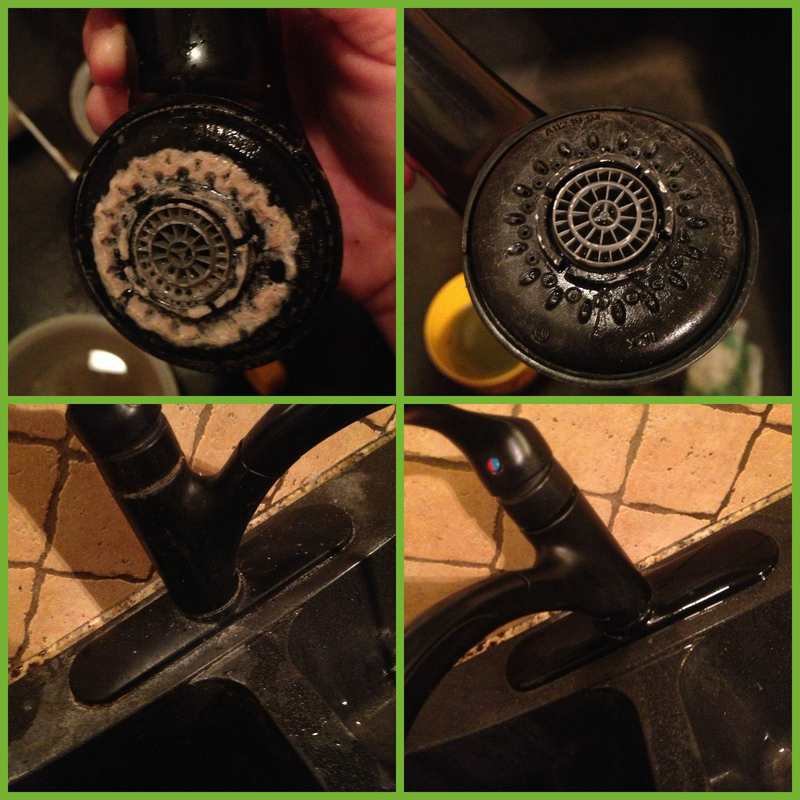 Everything from plaster of paris, to calcium carbonate, baking soda, and non-sanded grout. I’ve varied the ratio’s, intermixed the components, and begged my little experiments to behave more like a well mannered Chalk Paint. These homemade recipes just don’t measure up. Something’s just not quite right, something is missing. The truth is, every DIY Chalk Paint Recipe in the world will fall short of a true Chalk Paint, because we are missing secret ingredients!! Use the secret ingredients in your DIY Chalk Paint Recipe. Yep! It’s that simple. Use the secret ingredients in your DIY Chalk Paint Recipe. Problem Solved! 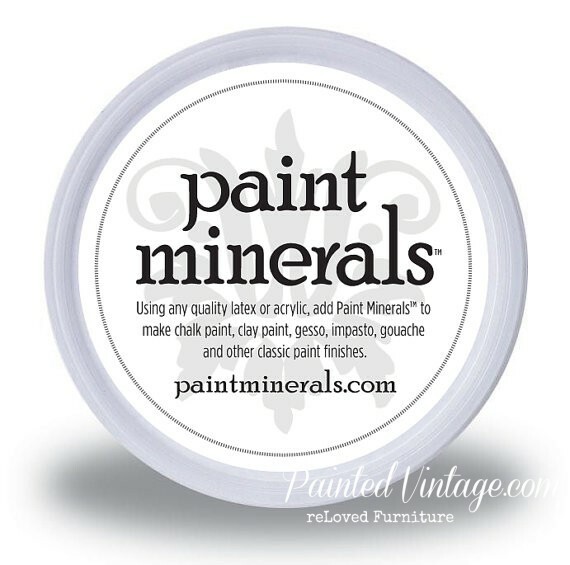 I’ve found a product called “Paint Minerals” -it’s the exclusive blend of mineral additives specifically formulated to create Chalk Paint. All you do is add the mixture to any brand of latex paint, in your choice of color, and you have just created your own Chalk Paint!! If you want a high quality Chalk Paint be sure you use a high quality paint as your base. Don’t expect $40 results from a $2 quart of paint, unless it’s a mis-tint, and in that case Rock On!! Also, true Chalk Paints are flat, so you’ll want to take the sheen into consideration as well. I have been using this formula to paint my reLoved furniture for a while, and I am in deep love!! What I admire about Paint Minerals (besides the price) is the versatility. I like to think of it as an on-demand kind of freedom. I can mix a small batch in any color, and achieve a high end result! I don’t need to invest in countless quarts of Chalk Paint. I don’t even need to mix large quantities. I’m free to be creative on a whim! If you’d like to read step-by-step mixing instructions, check out my tutorial here. Also, this product is excellent for making Gesso, Impasto and Gouache. So when the opportunity came available for me to distribute the product, of course I could hardly contain myself!!!! I am truly excited to announce Paint Minerals are available online, through my Etsy shop, and only $7.95 for the 1 quart mix is HOT!! 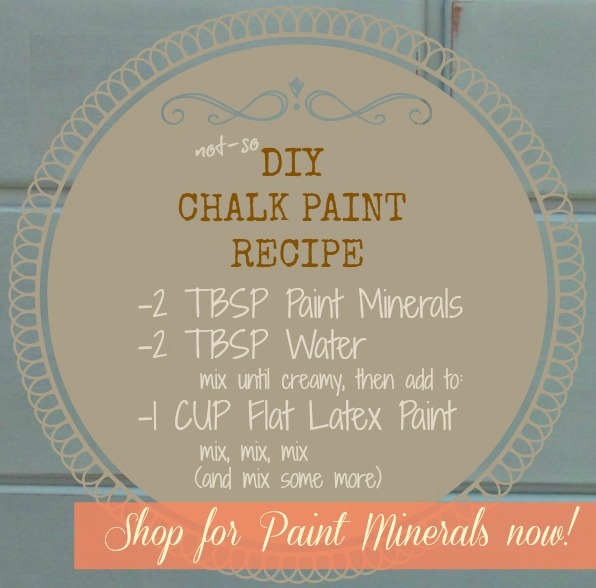 What is your experience with a DIY Chalk Paint Recipe ?? Would you be more likely to try a packaged Chalk Paint Additive, or a homemade blend? I’d love to hear your feedback! 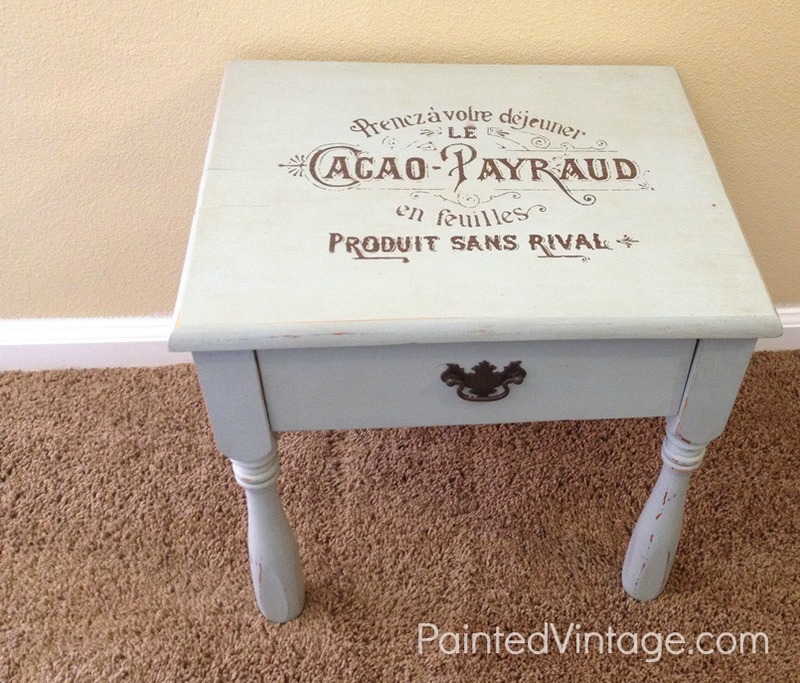 I have been using Plaster of Paris to make my chalk paint with excellent results. I choose my favorite color, buy 1 pint of deeply pigmented high quality paint and dilute it to my liking with some leftover EGGSHELL beige of which I have 5 gallons. The cost is minimal, the results are great (in spite of using a non-flat latex) and I can complete many projects with paint in shades of my favorite color! 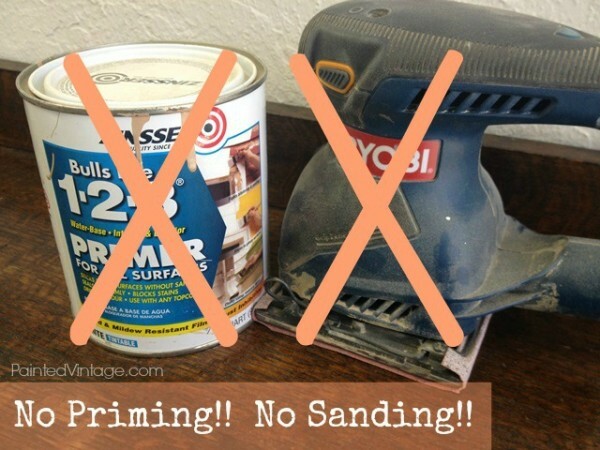 They all require sanding first, even the expensive brand name “chalk paint”. The massive advertising they’ve done for five years about ‘no sanding needed’ isn’t true, it still chips off easily from any kind of minor shiny surface, with just a little fingernail scratch. So since they all have this flaw, why not go the low cost route, thank you for the idea. How much MINERAL DO I USE AND HOW MUCH WATER???? p.s…I also really appreciate the info on wax vs. polycrylic! Thank you, thank you, thank you!! Good gracious! This is Feb, 2017 and I’m just now seeing your post/s on chalk paint. My name is not “Miss Got-rocks” and paying the price for ASCP is not going to happen in my lifetime anyway. I wish I’d seen your site first! Of course, I really like the idea of no sanding or priming, but I do other crafts using plaster of paris and unsanded grout and both of these are pretty gritty (which is why I use them on faux stone projects) and really wasn’t comfortable with mixing either of them with paint. With the thought of using baking soda, I get this really strange visual of paint foaming up and over the top of the can – I don’t think so. I’m not ready yet but I’m hoping you still distribute the Paint Minerals. I’ll most definitely become a customer! does this work for acrylic paint as well?? If not are there any other ways to make chalk paint from acrylic? Plaster of Paris is calcium carbonate. Maybe you can get it from a pharmacy. You can also use whiting chalk. Or just use gesso, add latex or acrylic paint to color it, and voila! I’ve had great success with homemade chalk paint. I use 2 Tablespoons plaster of paris, 2 Tablespoons calcium carbonate (soil amendment I bought from a farmer in Idaho, and 2 Tablespoons water. I buy one of those cheap plastic paint quart containers with a lid and mix the dry ingredients in the containers, then add 2 Tablespoons hot water. Mix thoroughly so there are no lumps. I then add 2 cups of paint. The lid comes in handy to keep it good between coats. Next project is painting a piano!!! How well does your chalk paint formula distress? Hi Julie, I was wondering about the recipe, and what amount of water do you use? In one place it says 2 tablesoons, and the other it says about 3 tablespoons. Which one is the correct amount? Thank you so much for sharing this with us. I’m do anxious to try this out!! I know you like purdy brushes for the poly, but what brush do you prefer to use to apply the chalk paint? I really want to repaint a crib before baby comes in August (feeling ambitious!) do you know if chalk paint is safe to use on baby furniture? The crib itself is not that old, it is just a dark wood that I would like to paint white. I love your website and all the tips! I’d like to try the paint minerals but (forgive me) it’s so hard to wrap my brain around the idea of not having to sand or prime first. I have a wood armoire covered in a glossy polyurethane (not sure if it’s oil or water based). Do you think I could try latex with paint minerals straight on the armoire or should I use a deglosser or anything first? I don’t want the dark wood to show through (I’m not planning on distressing the finish). Thanks! Yes, you can repaint your armoire with Paint Minerals and Latex without sanding or deglossing. But I would recommend washing it down with a tsp substitute first, and then make sure you are using a good quality paint with a lower sheen. If you have concerns, you can opt for a paint and primer in one as your base. Coverage will depend on the paint, not the Paint Minerals. good Luck with your project! I’d love to hear your feed back Lynne! I am finding most people absolutely love the Paint Minerals! …and it’s not gritty at all! 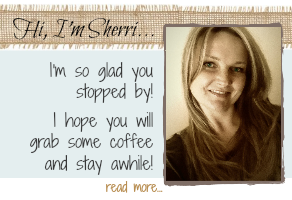 Hi there:) loving your website and before and after pictures, very creative and beautiful! I too refinish furniture (am in Grand Rapids, MI) and although I spray all of my pieces with a pigmented waterborne lacquer product, have been interested in playing around with chalk paint. I must say that the idea of not having to sand or prime is the main reason:)After looking and trying a few different homemade recipes, I am excited to give this a try. I will still be using my lacquer most of the time but it sure would be nice to have another option. Not to mention I miss sitting down with coffee in hand and painting away:) Thanks for sharing and will be ordering on Etsy! This may be a very silly question- but what if you just sprayed the finished item with clear rustoleum?